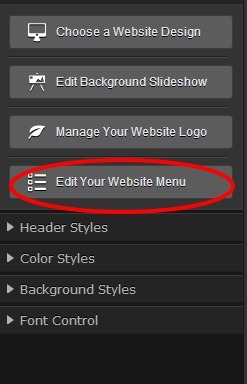 Your navigation menu text buttons are controlled from your Redframe Admin/Site Editor with the website Menu Editor feature. The Menu Editor feature allows you to drag and drop items into place in the order you would like them to appear in the navigation menu on your site. You have a total of 7 buttons you can manipulate for your Website Navigation for placement of Pages (both internal and external), Folders and Galleries. You can place as many pages, galleries or folders as you like beneath the Menu buttons which appear as drop down menus. However, if you have mass amounts of Galleries, we highly encourage you to use the Folder and Sub-folder feature to help organize your galleries and avoid huge drop down listings of galleries on your site navigation menu. Click here for information about Organizing your Galleries into Folders. You can also drag and drop entire columns of pages or folders/galleries into a different order from within the Menu Editor. Place your mouse above the heading of the column you want to move. A symbol with arrows crossing will appear. NOTE : There is also access to the ‘Menu Editor’ by clicking Edit Menu under Manage and within the ‘Manage Your Galleries’ area .